Charming, Rustic Cottage perfect for your next get away. Tucked in a quiet corner on Musky Joe's Twin Pines Resort. Family-owned and ran for over 60 years! Located on a Class-A Musky Fishing Lake. Boat and motor rentals available onsite), dock space, and boat landing all for your convenience. Main Lodge for checking in, renting boats and motors, or information on the best spots to fish, eat, and more. Sprawling resort grounds and nature trails for hiking. Located on a beautiful, quiet bay teaming with wildlife. You can catch pan fish, crappies, northern pike, and even musky right off one of our docks!!! 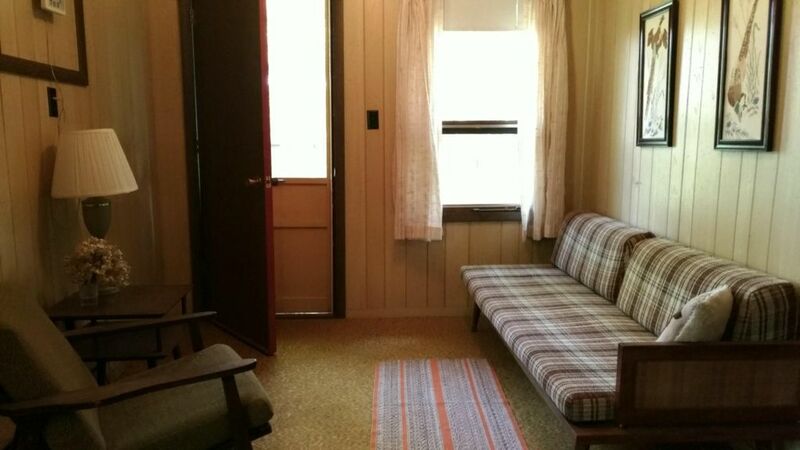 Enjoy our vintage style cottages with full kitchens, bathrooms are equipped with shower stalls, and cozy living rooms. Cottage #6 is a one bedroom duplex style cottage. Our bedroom is set-up with a double bed. The living room has a pull-out sleeper sofa. Full kitchen and dining area for your convenience. One full bathroom. Extra guests needing private space? Be sure to book Cottage #7, our three bedroom cottage on the other side of the duplex. We look forward to hearing from y'all!!! For more information feel free to contact us. Each one of our cottages is the product of my Grandparents' love and hardwork. I, myself, grew up helping clean the cottages, "tend" bar, keeping the grounds clean, etc. I couldn't imagine a "job" more rewarding than continuing the legacy. Each cottage is set up with the comforts of home, without all the distraction. Views of the famous Chippewa Flowage can be seen from each living room window. Screened in porches to have a drink while watching the sun set (or rise.) Top Notch fishing right from the docks! Each cottage comes dock space and a place to launch your boat right on site. Oh, and we LOVE dogs ;)! Small, quiet, family ran resort. We are slowly working on reestablishing our beach area. It is swimmable and my kids do enjoy swimming in the bay. For sandy beaches and adult swimming the Flowage is full of public island beaches. All of our cottages provide a gorgeous view of the Chippewa Flowage. Walk out your door and walk down to our gorgeous bay. Docks and boat launch onsite. Telephone available at main lodge for emergency calls. Portable units available. Inquire up at the Lodge. Parking available by cabin, more space available in main lot, boat trailer parking available by the lake. Cozy in kitchen dining area. Flat Screens and DVD players. We have a handful of DVD's available for your enjoyment. Sprawling open grounds with a badminton set, horseshoes and a variety of other lawn games available for your enjoyment. Kayaks and Paddleboat available for customer use. First come first serve basis. Boat and motor rentals available. My husband and I loved it here, it was so relaxing. We couldn't have been happier, the location is amazing and the people are great. Hoping to go back next year.